As a part of my comparative review series of all textbooks for undergraduate medical subjects, I am adding this article about Textbooks of Ophthalmology which are best content wise, most read by students, recommended by seniors and professors and are available in market. I am including both UG and PG level books but students are advised only to read UG level books for their UG exams. This book needs no introduction to any UG medical students. 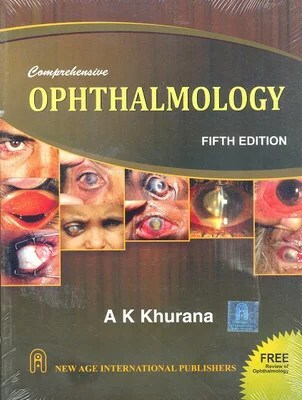 It is the best book for Ophthalmology for UG level preparation. It gives each topic in detail just enough to understand it and to recollect in exam. So this book is good for both exam oriented preparation and well as for understanding of the subject. It also gives section for Ophthalmological instruments, clinical methods, clinical cases and procedures in the end which is very useful for practical exam preparation. In an all a must read book for all UG medical students. This is an alternative to Khurana. Explanations of very topics are very good but a very good book for remembering the topics. So students are advised to use this book as an alternative to Khurana, and refer it for understanding of topics which they are unable to do from Khurana. I am also including following books which may be useful for students who do not like above mentioned books. These PG level books are only for reference purpose and should not be used as first choice of reading under any circumstances by UG students. If students have more recommendation or have points to add to those I have mentioned, please comment below.